The WITTENBERG_PALAST is an oasis in which one spends a moment and dips into a Biblical time. You rest on oriental pillows, enjoy the scent of myrrh and incense, quench your thirst with crystal clear water, fresh mint and taste almonds, dates and figs. Is that a harp or lute I can hear? 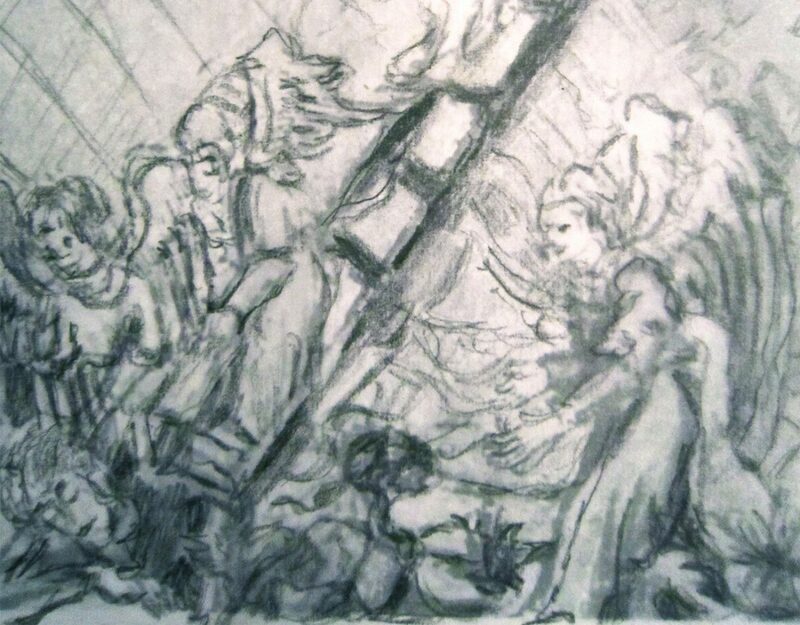 You read the Old Testament, the foundation of the Torah, and observe paintings of the angels that artists have been concerned with for centuries. You open your senses and become part of this world of myths, angels and dreams. Abraham is the common ancestor of the monotheistic religions. He is the ancestor of the Israelites and the Ishmaelites. Angels appear as messengers and preachers of God in the Torah, the Bible and the Koran. The struggle with God, concerning faith, preoccupies all of us. Where do our roots lie? Who are we? Where are we going? What connects us to others? What knowledge do I personally have about the Jewish people and their history, their religion? What images are created before my eyes? 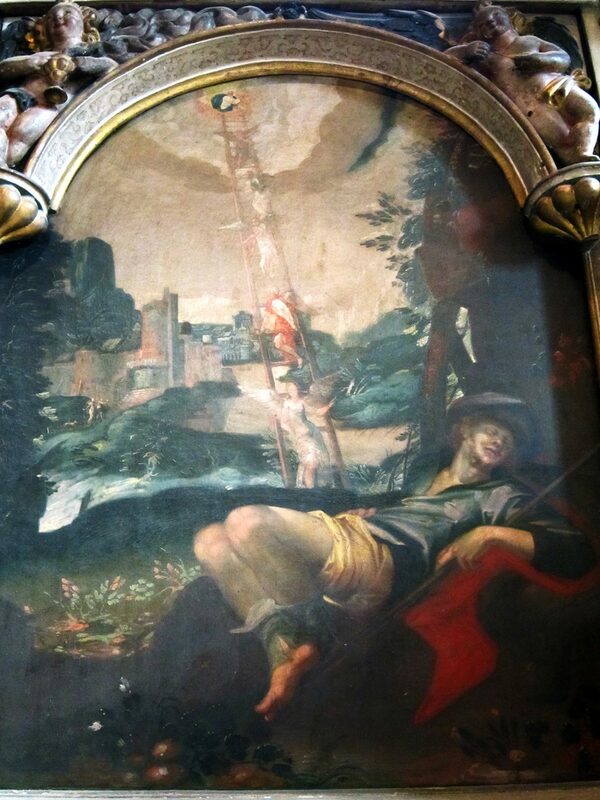 Perhaps the bird Zev will appear, headed to the Stadtkirche (town and parish church), and show the picture ‘Jacob‘s dream of the ladder’ by an unknown painter from around 1615. Outside the church, your view drifting towards the sky, you don’t believe your eyes, as you discover a sandstone relief, the ‘Judensau’ (‘Jewish sow’). Due to the Reformation that originated here 500 years ago, Wittenberg is a ‘place of Christianity’, a pilgrimage site and a national symbol, and was even a synonym for progress and scholarship during Shakespeare‘s times (hence why he located Prince Hamlet to study here). … Let not thy mother lose her prayers, Hamlet: I pray thee, stay with us; go not to Wittenberg. ‘500 years of the posting of the theses’ offers the opportunity to wake Wittenberg from its slumber with a kiss of life, well beyond the Reformation anniversary. The non-profit foundation KulturBotschaft was founded in 2012 in Wittenberg and is a young project space in the heart of the historical centre of Wittenberg, which is otherwise oriented towards the Reformation and Luther. The aim of the KulturBotschaft is to initiate and accompany dialogues and encounters that cross social, religious and cultural boundaries. The foundation provides infrastructure for lectures, discussions and exhibitions. It supports and organises artistic, cultural and sociological projects. For the world exhibition of the Reformation the focus is on the forgotten, erased and repressed common Christian-Jewish roots. The digging and exploring, and the attempt at remembrance, also represents an object of projection and is the foundation of a common secular modernity.